I love the taste of blistered tomatoes. Adding them to crisp green beans makes this side dish extra special. 1. Preheat oven to 450°. Place a jelly-roll pan on top rack in oven (keep pan in oven as it preheats). 2. Combine oil, salt, and pepper in a bowl. 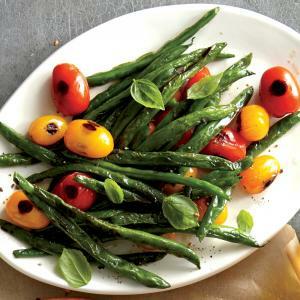 Add tomatoes and green beans; toss to coat. Carefully add green bean mixture to preheated pan; bake at 450° for 10 minutes, stirring after 5 minutes. Turn on broiler (do not remove pan from oven). Broil 5 minutes or until tomatoes begin to char. Remove pan from oven. Sprinkle with basil.